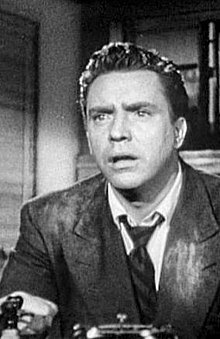 Edmond O'Brien as Frank Bigelow. Pamela Britton as Paula Gibson. Laurette Luez as Marla Rakubian and Luther Adler as Majak. D.O.A. is a 1950 film noir about a businessman who has been poisoned for no apparent reason. With only a short time to live, he sets out to unravel the mystery. Directed by Rudolph Maté. Written by Russell Rouse and Clarence Greene, based on the play Der Mann, der seinen Mörder sucht by Ernst Neubach. Do you realize what you're saying? You're telling me that I'm dead! [After being told his grim prognosis] Do you realize what you're saying? You're telling me that I'm dead! I can breathe and I can move, but I'm not alive because I took that poison, and nothing can save me. The woman always gets hurt more than the man. I told him I was your confidential secretary, but I guess I didn't sound confidential enough. Majak: He's not afraid. You can tell from a man's eyes when he is afraid. Look at his eyes. Chester: That's the way I wanna see you go, Bigelow... nice and slow. Homicide Detective: Can I help you? Frank Bigelow: I'd like to see the man in charge. Dr. MacDonald: Of course, I'll have to notify the police. This is a case for Homicide. Dr. MacDonald: I don't think you fully understand, Bigelow. You've been murdered. Frank Bigelow: Forget the bills. You know that coat you want? Get it. Paula Gibson: You are drunk. Paula Gibson: Frank, I don't know how to say this. Paula Gibson: Well, what I want to say is that there's nothing you can do that you ever have to feel guilty about. Frank Bigelow: Who's the blonde? Eddie: Oh she's one of the chicks that hang around here; she's jive crazy. Frank Bigelow: [about Reynolds] You're mighty careful about the picture of a man you haven't heard from in months. [about a signature on the photo] What does the 'Ray' stand for? Marla Rakubian: It was a pet name. Do you mind? Frank Bigelow: It all sounds very cozy, Miss Rakubian. You and Reynolds call each other pet names while you make a sucker out of Philips. Marla Rakubian: Philips made the deal because he wanted it. Frank Bigelow: Yeah, I'll bet you weren't above using what it takes to make him want it. Who's paying for this trip? Frank Bigelow: Really? A first class trip to Buenos Aires on a model's salary? Don't make me laugh. Since you and Reynolds won't be seeing each other anymore, you don't mind if I keep this, do you? Marla Rakubian: If I were a man, I'd punch your dirty face in. Frank Bigelow: You know I really believe you would. Deputy: How shall I make out the report on him, Captain? Captain: Better make it dead on arrival.